Sound View Electronics has been making automated messaging systems and improving moving walkway and escalator safety for over 12 years. We are the only approved provider of escalator announcement messaging systems for the New York City subway system. The NYC subway system is one of the most extensive public transportation systems in the world with 468 stations in operation and 229 miles of routes. It carries more passengers than all other mass transit rail systems in the US combined. The NYC Transit Authority is a very challenging environment for operation of an automated messaging system. The system needs to deliver clean, easy to understand messages in cavernous areas. The system has to be resistant to heavy vibration, dirt and grime and must be vandal proof. The NYC subway system depends on Sound View Electronics to help keep their 4.3 million daily (billion plus annual) riders safer by employing our automated public announcement systems to remind riders of safety issues while riding the escalators. 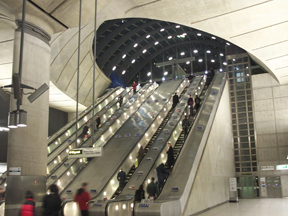 Another major use for our messaging systems is directing people where to go as they exit an escalator. Just imagine you are an out-of-towner traveling with children. You took a bus or a train to bring your children to see the big city. As you ride the escalator, the automatic message reminds your children how to ride safely and tells you where the station exits are. You do not even realize the benefits; you just keep walking. However, the bus or train station managers know they have provided a better experience for you. They also know that helping riders to avoid injuries while directing people to their destination improves the flow of people while reducing the risk of injuries. This helps enhance their experience which can help increase ridership. We also produce announcement systems for moving walkways that are used in airports and large facilities. Once again, our automated messaging reduces the risk of injury and informs people where to go. As the riders approach the end of the moving walkway a message may play reminding them to keep moving when they exit the walkway, to watch their step and that the escalator to the baggage area is on the left side of the large lobby. The automatic messaging system can help make the passengers’ experience safer and make it easier for them to get to the baggage area. The airport goes the extra mile to keep their passengers safe and people traffic flowing, thereby reducing the risk of lawsuits. Our automated messaging systems can also be employed by bus or train stations and amusement parks. Sound View Electronics automated announcement systems can be utilized for advertising messages. As hungry passengers are riding an escalator or walkway, automated messaging could offer a special at a local restaurant. In addition to safety and directional messaging systems, Sound View Electronics automatic messaging can deliver advertising in hotels, casinos, amusement parks, arenas, stores and shopping malls.